Windows and doors are vital to any home, but at the lake, the views can be showstopping. We all want to capture the best view possible. This means keeping our windows and glass doors clean and up to date. Although we want to see as much of the scenery as possible, privacy needs must also be considered. As we refresh and renovate our lake homes, it’s a good idea to look to the experts to see what options we have in windows and doors today. For door styles, Robertson has found that French doors remain popular. This style has two identical glass-paned doors, which lock in the center where they meet. An option for additional visibility is to install matching stationery glass side panels. He says that conventional sliding doors declined in popularity when some of them developed issues with hazing glass. Also, economy sliders sometimes proved difficult to slide along the tracks, and provided little security. But Robertson says, “New sliding door products have improved tremendously, and one should not expect to sacrifice function, comfort, or security when choosing them.” He notes that a homeowner should consider their floor plan and functionality expectations—a sliding door will consume less floor space and will not be swinging into furniture or walls, but will generally offer less space for opening than French double doors. 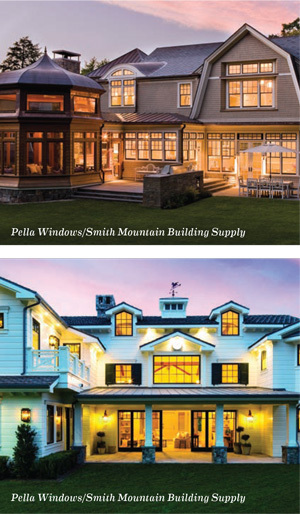 As far as specialty features go, John Morgan, millwork sales manager at Capps Home Building Center, says, “Of all the products we sell, Andersen Windows and Doors offer the most options. Lately, blinds in the glass have become a popular choice.” Blinds or shades are available in both picture and casement windows, and hinged or sliding doors. “There are color options for each,” he adds. “In most of their products, the blinds or shades are installed in a panel that attaches to the sash or frame. This allows you to have both insulated glass and the blinds, giving you a triple pane.” Morgan notes, however, that sliding doors come with blinds or shades inside the insulated glass panel, because the doors must be able to slide by each other. Morgan has some screen suggestions as well. Retractable screens allow you to pull the screen down only when you need it, keeping your view crystal clear the rest of the time. Alternatively, Andersen’s TruScene® screen is made with a micro-fine stainless steel mesh, which is said to improve the clarity of the view by 50 percent. With lake homes, large walls of windows and doors are popular. Andersen has several lines of “Big Door” products to help blur the line between inside and outside. Bi-parting doors are sliders that split in the middle instead of at one side, creating a nice wide opening. Four panel bi-parting doors provide even more view, featuring four individual panels, with the two in the center sliding to each side. Lift-and-slide doors can take that a step further—Morgan says that for a 20-foot opening, five or six lift-and-slide door panels can be installed, which all slide to stack up in front of a single panel. And finally, folding doors open outward and fold up like an accordion. They can be made up to 10 feet tall and 48 feet wide, so your room truly becomes part of the outdoors. Bi-parting and folding Andersen doors are on display at the Capps showroom. 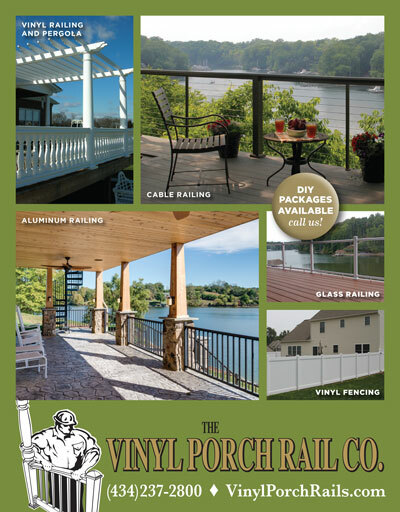 Likewise, Robertson says that a significant trend in the industry is the “Scenic Doors Line” offered through Marvin Windows at Smith Mountain Building Supply. There are multiple configurations available, including pocket door and stacked panel configurations, and accordion-style doors. Robertson agrees that these options, which can span openings of up to 50 feet wide and 10 feet tall, offer expansive views that will bring the outdoors into your home. When selecting windows and doors, Morgan recommends that you choose a product with high performance insulated glass. He notes, “If more energy efficient glass is needed, the SmartSun™ option is available. This glass helps block heat and most UV rays, and helps prevent the fading of floors and furniture.” Andersen also offers a high performance sun glass that is tinted, to block even more heat if needed. 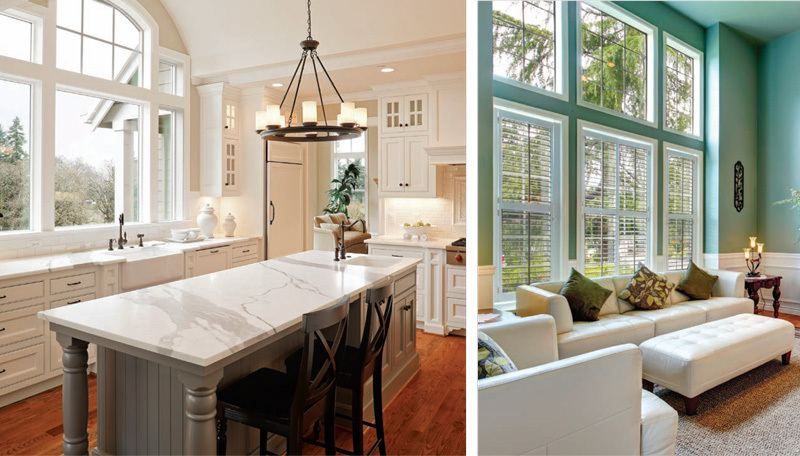 So when considering your new window or door, take some time and visit these two local companies to see the displays and talk with the experts who sell them. Your next sunset could be even more stunning as you take in a panoramic lake view through your new windows and doors.